Standard angle frame bleachers are the most typical design of angle frame bleachers with 8 inches for rise between rows and 24 inches for tread/run. They tend to be multiple of five rows: that is 5 rows, or 10 rows, or 15 rows, etc. “Elevated” – when there is a front walkway typically 30”-40” elevated from the ground which is accessed by means of stairs or wheelchair ramps. Standard bleachers also tend to have “Semi-Closed Decking”, which means that there are open gaps in the decking. 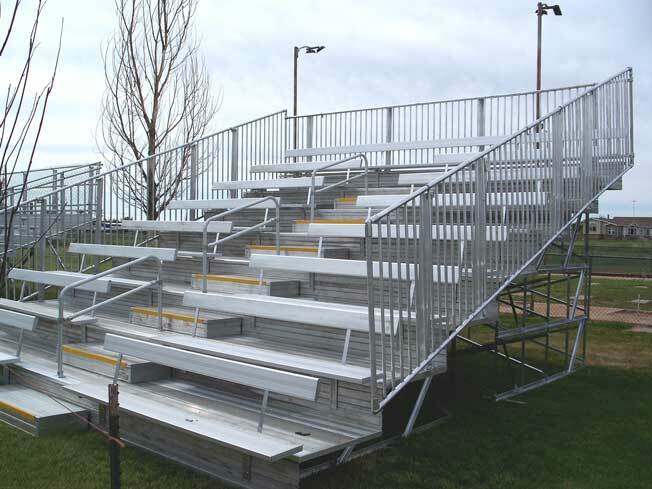 Customized angle frame bleachers are those that deviate from the standard type to meet certain space requirements or meet special design. At times the situation call for more leg room, then instead of being 24” the tread becomes wider: typically, 26.5”, 29”, 30” and up to 36”. In fact, to add features like back rest to the bench seats, the tread has to be 30” minimum. And to have stadium chairs instead of regular bench seat, we need even larger, ideally 36” tread. Also, the location of the bleacher requires at times better sightlines and this is accomplished by making the bleacher rise between rows higher than the standard 8”; typically, 12” or 14“or even 16”. These high rise design bleachers require mid steps at aisles to conform to building codes. These bleachers can also be done with fully closed decking, which provides the added advantage of having no debris come through under the bleacher. 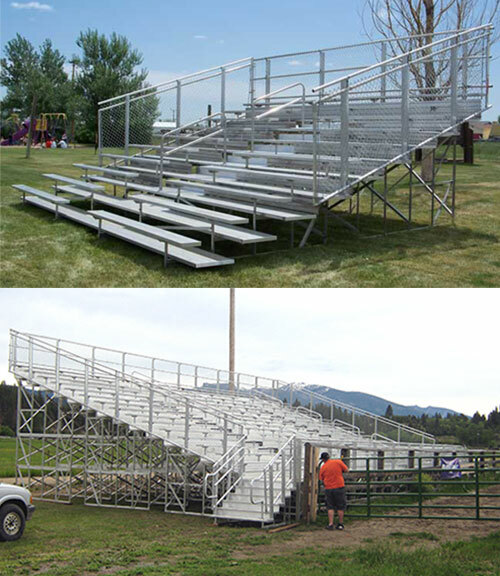 First Class angle frame bleachers are bleachers designed with the user in mind, a unique design by Bleachers International. Our First Class Bleachers let everyone see the event and sit comfortably as well. It offers almost 60% more height between rows, and extra 12 inches of depth between rows, along with integrated back-rests. 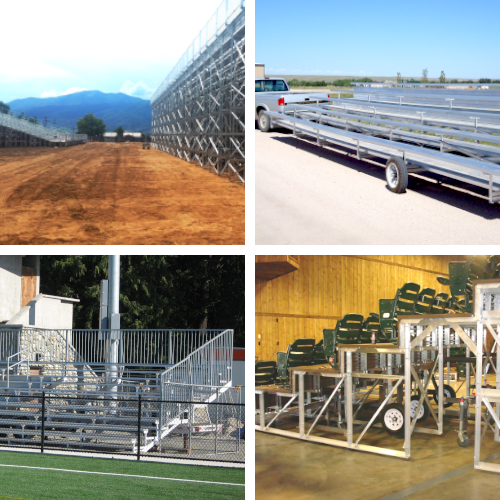 Compared to industry standard bleacher configuration, our First Class Bleachers offer superior sightlines, much more leg room and back support. 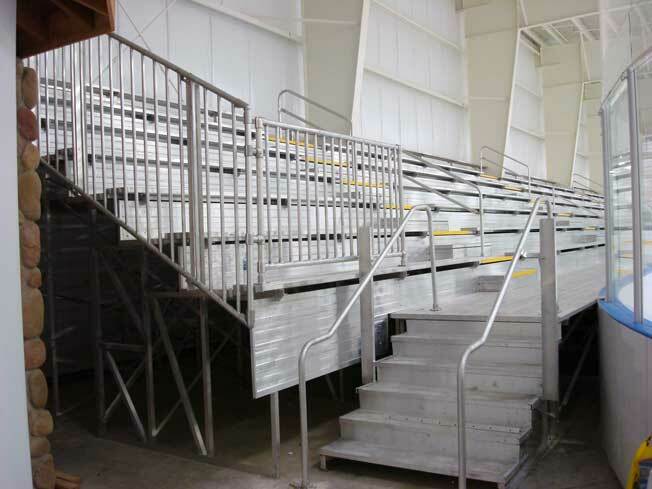 Along with vertical rail and fully closed deck design, First Class Bleachers are the most comfortable, safest and easiest to clean bleachers available.